The Market is Segmented by Application (Commercial, Military), and Geography. The helicopter simulator market is projected to grow at a CAGR of 2.54% during the forecast period. In recent years, the processes for pilot certification and regulatory requirements have become increasingly stringent. Due to this, the growth in the number of certified pilots has reduced gradually over the years. The need for trained pilots is generating a demand for helicopter simulators. There is a growing emphasis on the safety of pilots and helicopters during training. This has lead to the adoption of simulators for helicopter pilot training, which would drive the market for helicopter simulators in the years to come. The development of newer generation helicopters will generate a demand for helicopter simulators customized to the respective control systems, driving the global helicopter simulator market. 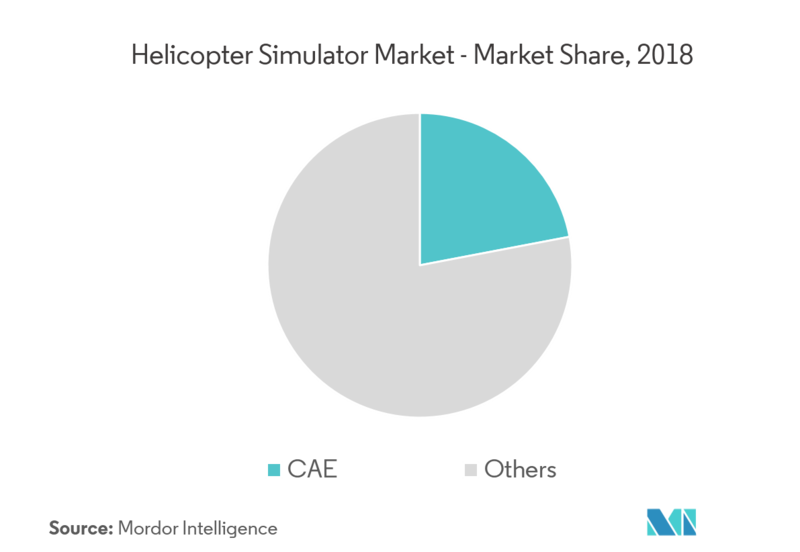 As of 2018, the military segment has the highest market share in helicopter simulator market, compared to commercial helicopter simulators. The higher share of the military segment is primarily attributed to the fact that the usage of helicopters in the military was a lot more compared to commercial purposes. Also, a larger number of helicopter pilots are trained for military helicopters compared to commercial helicopters. These are the main factors for the higher market share of the military segment. This segment is also projected to experience a higher growth rate during the forecast period. During the forecast period, it is projected that the demand for military rotorcraft pilots would increase due to a larger rotorcraft fleet expansion initiatives pipeline by varous militaries, which would help the growth of the segment during the forecast period. 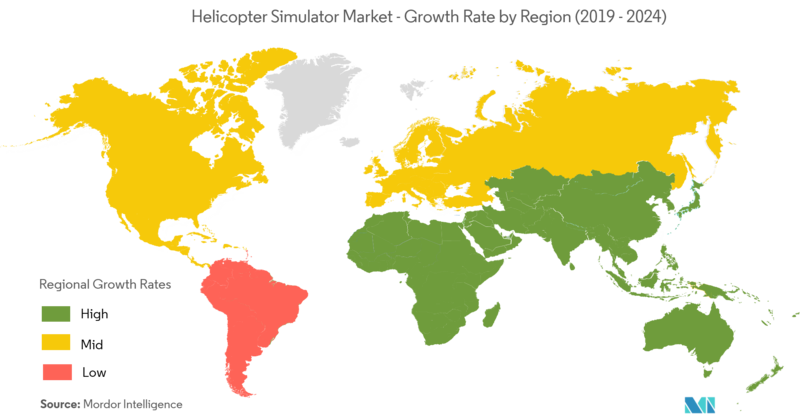 North America is currently leading the market for helicopter simulators. This is due to the fact that the North American region has the largest military power in the world and thus have witnessed significant growth in deliveries of helicopter simulators for military applications. Also, the commercial helicopter fleet in the region is the highest in the world. These are the main reasons which have propelled the revenues in the region as of 2018. But the growth of this market is the highest in Asia-Pacific, due to increasing helicopter procurement, mainly for militaries, in countries like India, China, Japan, and South Korea. Additionally, helicopter accidents during training have become more in countries like India, which have made the countries to emphasize more on simulator-based training for helicopters. 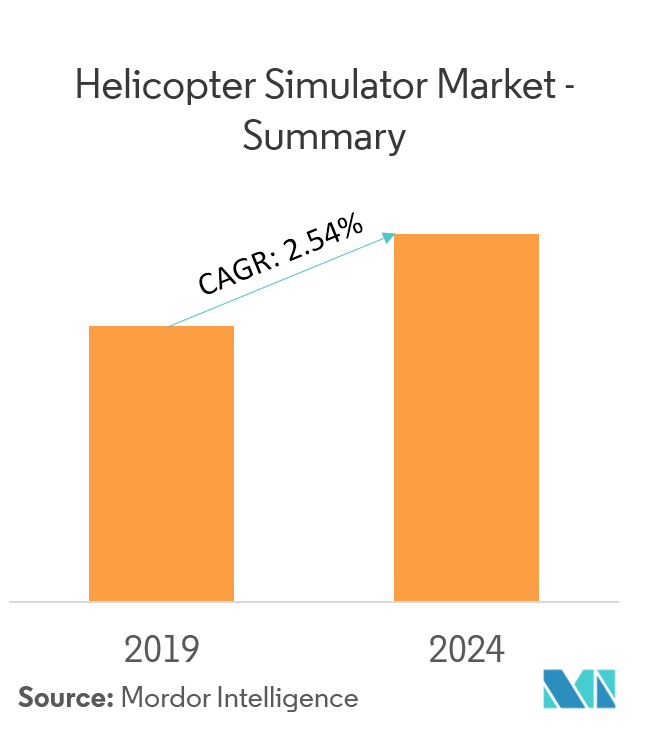 The market for helicopter simulators has now started its transition towards becoming a fragmented one, with several vendors starting to offer their respective simulators for various end-user segments, comprising of both sophisticated simulator types and simple ones. The slow growth in sales of helicopters in some of the matured markets in North America and Europe have slightly hampered the sales of helicopter simulators in the past few years. Simultaneously, the growing demand for helicopters in the Asia-Pacific and the Middle East countries have shifted the focus of several simulator OEMs from North America and Europe to countries like China, Japan, Australia, Saudi Arabia, United Arab Emirates, and India. Of late, collaborations and partnerships, have played a major role in the success of aerospace and defense companies, as sharing of technology has boosted the growth of new simulators that can artificially create real time critical situations for the pilots during training.